We're honored to have Laura McNeal here to tell us more about her latest novel THE INCIDENT ON THE BRIDGE. Laura, what was your inspiration for writing THE INCIDENT ON THE BRIDGE? Three things: the belief that it’s lucky to find an unbroken sand dollar, the high rate of suicide from the Coronado bridge, and the myth of Pyramus and Thisbe. My favorite scenes or passages tend to be those that come easily and more or less whole. The last chapter of the book was like that. Oh, that’s a hard one. Books are like food, and who knows if you’d like my favorite Thai soup, but I’d recommend Felicia’s Journey by William Trevor and After This by Alice McDermott. They both enter multiple points of view with beautiful dexterity, and Felicia’s Journey manages one of the most difficult feats in literature, which is to create not just a convincing murderer but also the long lost state of innocence that makes him similar to every one of us. How long did you work on THE INCIDENT ON THE BRIDGE? The importance of things that were not "Writing, The Pursuit of Perfection In." I would have gone insane without my family and friends and the way I felt when I was running on the beach, where I would look (sort of desperately) for what Wallace Stevens calls the angel of reality. The angel of reality is (in my interpretation) a beautiful thing that makes you forget yourself and your problems. What do you hope readers will take away from THE INCIDENT ON THE BRIDGE? The die is not cast. And if it is, you probably have no idea what the number on top signifies. We’re often completely wrong when we interpret signs and symbols, people, conversations, our own worth. I mean this in a hopeful way. Oh, the road. The awful, beautiful, fog-covered road. It changes all the time. It climbs steeply uphill when you think it’s going down and down when you thought it would go up. Writing and publishing four novels with my husband was like gliding along on a tandem on an avenue by the beach. But I failed to sell a novel I’d written by myself during those years, and then, in the early fall of 2010, I thought Dark Water was a huge, public, humiliating failure (dead end with precipice). Dark Water became a finalist for the National Book Award on October 12 of that year, and eventually the unsold novel sold, and both times it was like that moment in a cartoon when a character grabs a branch on his fall into the precipice. The road was great after that. For one month. There is no key. Or there is a different key to every door, and they’re all mixed up in a giant bag. The person who succeeds is the one who keeps trying different keys. I sit on the sofa with my dog. I look like I’m not working at all. Sometimes, in fact, I’m not. Two novels and a crazy idea for a musical. Believing that you can do something ambitiously crazy, something you have never done before, is the only way to keep enjoying life. When she is not writing, Laura McNeal tries to decide if it's better to turn people's socks right side out for them or to wait (no matter how long it takes) for them to see the need themselves. She considers this question in Southern California, where she lives with her husband, the writer Tom McNeal, and two teenage boys who wear a lot of socks. 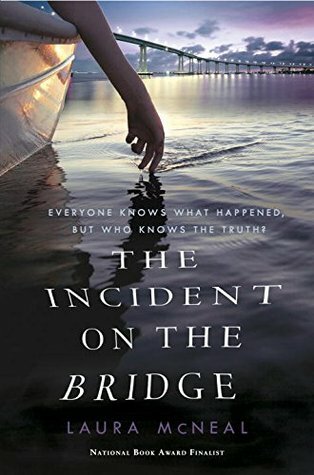 Have you had a chance to read THE INCIDENT ON THE BRIDGE yet? While writing, do you have scenes that come to you more or less whole? Do you keep trying different keys to the various doors? Share your thoughts about the interview in the comments!